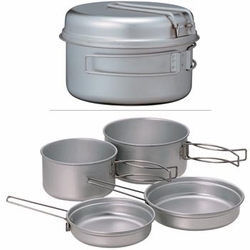 Snow Peak Personal Titanium Cookset is lightweight, compact and durable. It is ideal for one or two backpackers on the go. Includes: Pot 32oz, Lid 6-1/8" diam x 1-1/4", S Pot 23oz, Lid 5-3/4"diam x 1-1/4"